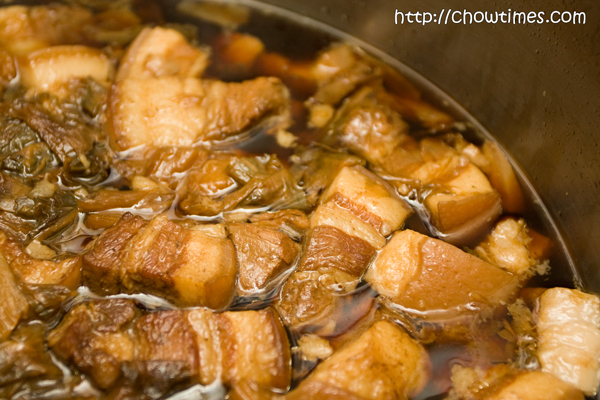 This recipe has different names like Mui Choy Khaw Yok, Stew Pork Belly with Preserved Vegetable, etc. I had did a steam version here. I just learned another method which directly cook the the dish on the stove from a Chinese cook show called “So Far So Good”. Gourmetbride, this post is for you. I like this version because the pork is so tender that it melts in your mouth. It is also more convenient as I do not have to worry about adding water to my steamer. I find that the steam version is not as tender. 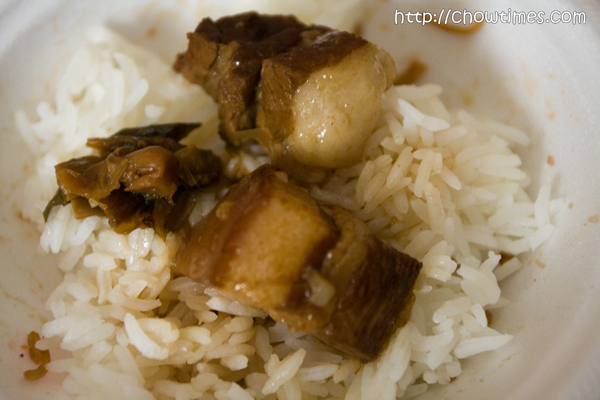 Mui Choy Braised Pork Belly is best served with steamed rice. My family loves this dish. They can just have one dish and have no complaints. In a large pot, dry fry the mui choy for a few minutes until fragrant. Add the sugar and sesame oil and fry for another few minutes. Add the pork belly and soy sauces and stir fry for a minute or two. We have Jane back in the Gilmore Park Church Community Kitchen to lead the kitchen. Jane demonstrated how to make fresh pasta here, here and here. This time Jane showed us how to make Risotto, an Italian rice dish. According to Jane, she only learned that there are different rice for different rice dish during her stay in Italy. There are rice for salad, rice for soup and rice for risotto. 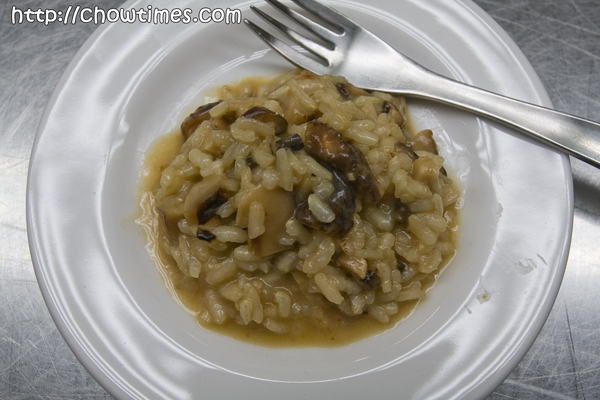 For Risotto, one has to use Arborio or Carnaroli rice. 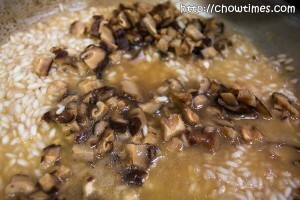 It is important NOT to wash or rinse the rice to retain the starch on the rice to create a creamy Risotto. 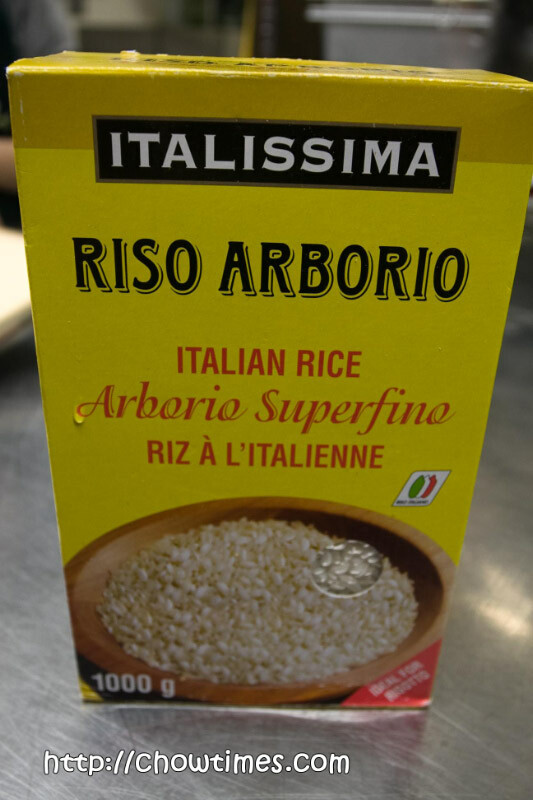 For Richmondites, you can buy Arborio rice from Papi’s in Steveston Village. Risotto is an Italian rice dish which is very creamy. You can flavour risotto with mushroom (preferably dried ones), asparagus, shrimp, meat sauce or as far as your imagination can go. For demonstration, Jane made a Shittake Mushroom Risotto and an Asparagus Risotto. The above is the Shittake Mushroom Risotto. 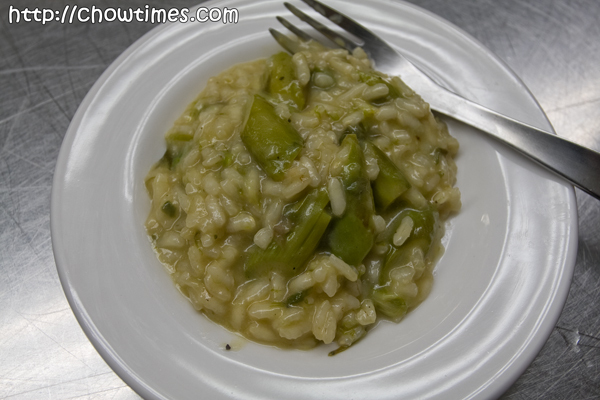 The above is Asparagus Rissoto. It is the type of rice and the method of constantly stirring the rice in broth which makes the Risotto so creamy. 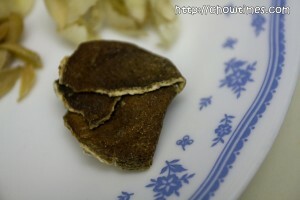 Jane used dried shitake mushroom which has to be reconstituted by soaking in warm water until soften. You may use other mushroom. Italian likes to use chanterelle. 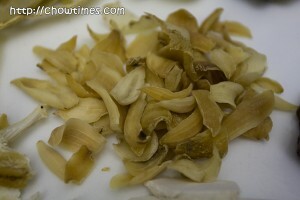 It is recommended to use dried mushroom as the flavour is more intense.The mushroom is to be cut into small pieces. Discard the stem or save them to make soup. 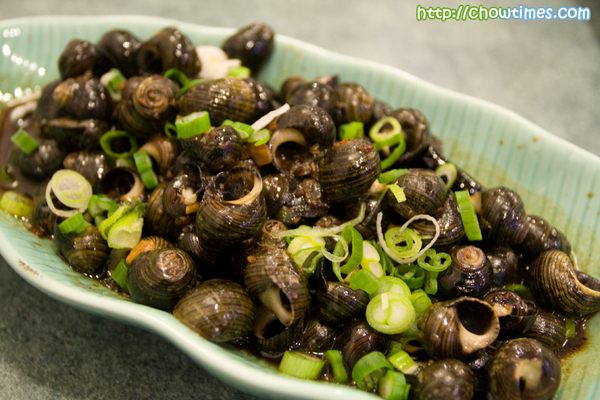 The quantity can be adjusted to your personal taste and availability. Reserve the soaking liquid as part of the broth to flavour the risotto. For the Asparagus Rissoto, Jane lightly pan fry the asparagus (cut into small pieces) with some olive oil. 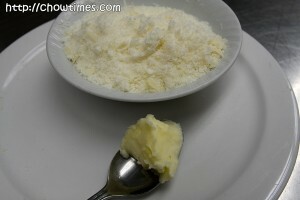 Jane emphasize on using freshly grated Parmesan cheese. Only use ready grated ones on emergency. Parmesan cheese is an old and very lean cheese and a little goes a long way. 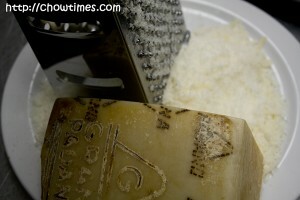 It is very expensive too.Parmesan cheese can be stored for a long time. Use a vinegar dipped cloth to wipe the surface of the cheese before wrapping in saran wrap will prevent mold from growing.The crust of the cheese can be used to flavour soup. 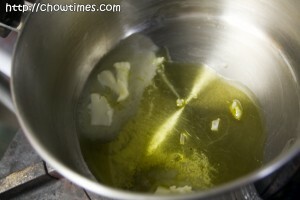 Heat olive oil and butter in a frying pan.An alternative to the butter is to use chicken fat for flavouring. Lightly sauteed the minced onion until blonde. 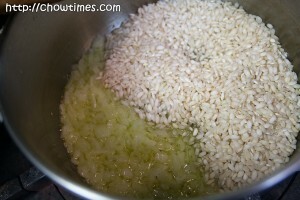 Add the rice and stir to coat rice with the oil. Stir the rice slowly and continuously with a wooden spoon until the rice kernel colour becomes opague and white.Another way is to add the rice first and stir until the rice is coated with oil. Move the rice aside and add the onions and cook the onion until blonde. Remember to continuously stir the rice so that they cook evenly and not burnt. 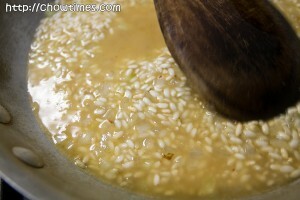 Once the rice turned opague, you can ladle in the hot broth, one ladle at a time and continuously stir the rice slowly. When the liquid is almost evaporated, add another ladle. This process has to continue until the rice is tender and the hard centre is softened. This may takes up to 20 minutes and the heat must be maintained to create a gentle bubble. It is the process of constant stirring that creates the creaminess in the risotto.When brown bits start to stick on the side of the pan, tilt the pan after you added another ladle of broth and scrape the flavourful brown bits into the mixture. 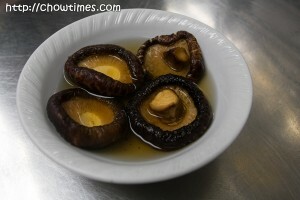 Dont forget to add the flavoring ingredients like mushroom or asparagus after the first or second ladle of broth. When the rice is done and almost all the broth is evaporated, remove the pan from the heat. Add a tablespoon of butter and a tablespoon of finely grated Parmesan cheese to the rice and stir to melt the butter and cheese with the residue of the heat. Butter and Parmesan cheese adds creaminess and saltiness to the rice. You may add salt to taste but we find that it’s not necessary. Jane, thank you for showing us how to cook Rissoto. Nanzaro is like a pitbull. When they latch on to you they never let go. Nothing makes them let go of their deadly jaws. For some unknown reason, he had been hankering Suanne and I for “gourmet” burgers … not just any burgers … but GOURMET burgers. McDonalds, Burger King and the likes will not do. 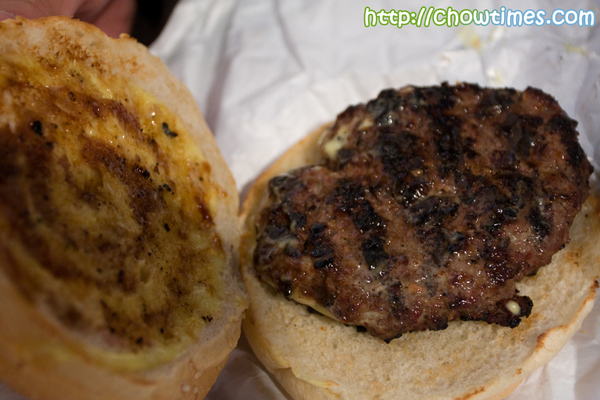 Nanzaro did some research over the net and narrowed his choices to either Splitz, Burger Etc or Moderne Burger. 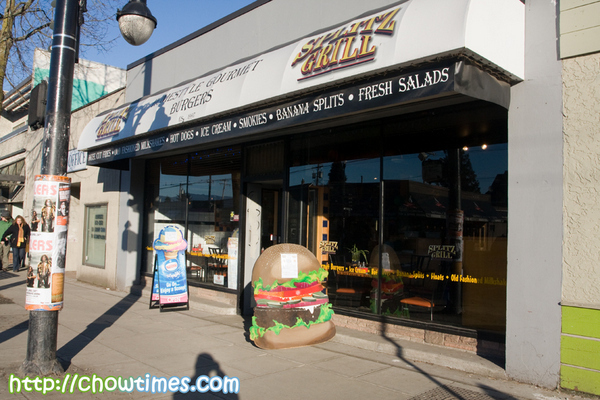 We settled for Splitz because the slogan on the http://splitzgrill.com website says “a true gourmet burger joint”. It had been quite a while since Suanne and I last had burgers. Moreover, it is good to have non-Asian food for a change. 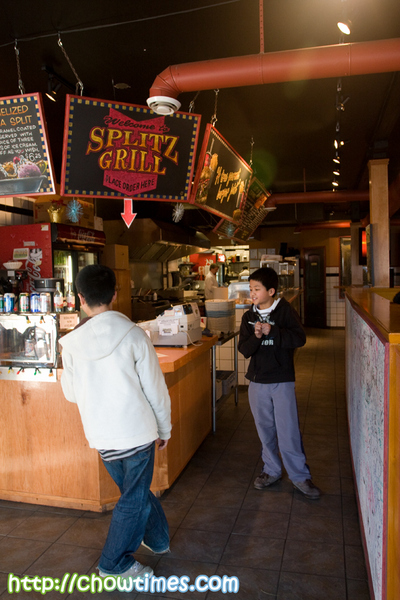 Splitz is located on Main St at 27th in Vancouver. 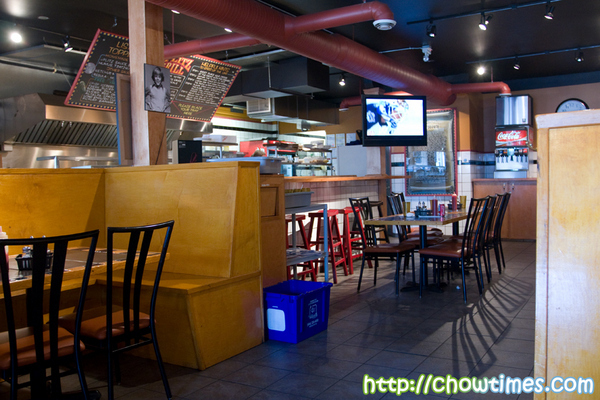 This place is actually a spin off from the very popular burger joint in Whistler. Ordering here requires you to go through the process of first placing your order at the front of the aisle. You then move on to the garnish station where you tell them the sauce and toppings you want. Most of the toppings are included in the price but some are extras, like sauteed mushrooms and bacon. The dining area is spacious and clean. It was not really comfortable but I do think that this is really fast food where people pop in, grab a sandwich, eat and go. Both Nanzaro and Arkensen ordered the Legendary Splitz Burger Combo. The combo costs $9.45 which included a small fries and small fountain drink. I am not sure why but Nanzaro ordered his pretty plain. He hates greens and so just opted for honey mustard despite me telling him he can have as many sauce or toppings he wants. 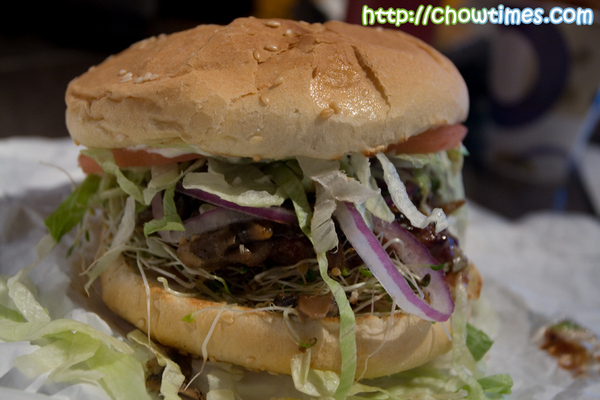 Despite the simple burger, it really looked very enticing — moist and juicy. This really shows how well they do burgers. Arkensen had the same as Nanzaro’s but he had the basics … ketchup, honey mustard, tomato and lettuce. I think we’re getting the hang of it. Suanne and I are getting more comfortable going to a Chinese restaurant. I am not talking to just any restaurant but ones that has ghastly bright yellow and red signs with an equally unimaginative name to match. 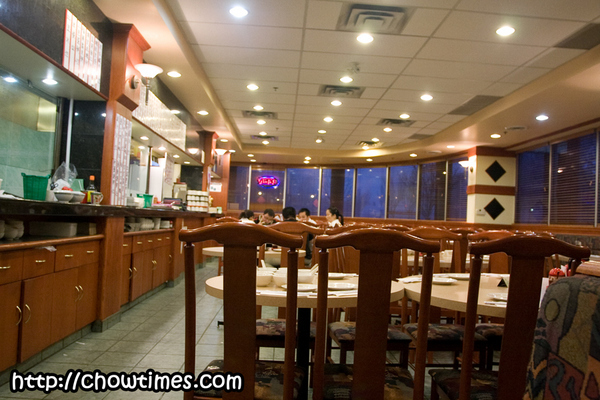 These are the type of restaurants that are almost always a mainland Chinese restaurant serving authentic Chinese food. 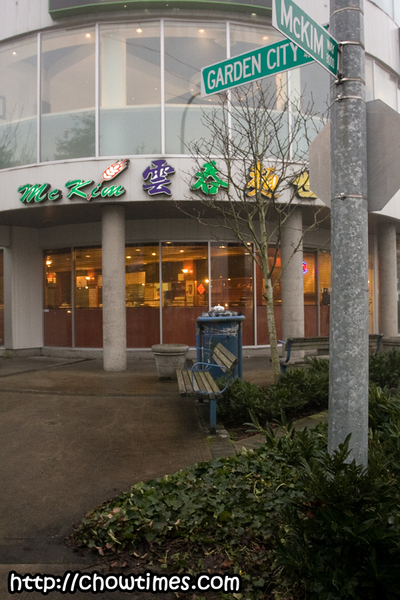 Suanne and I chanced upon this lonely Chinese Restaurant while driving along Kingsway. 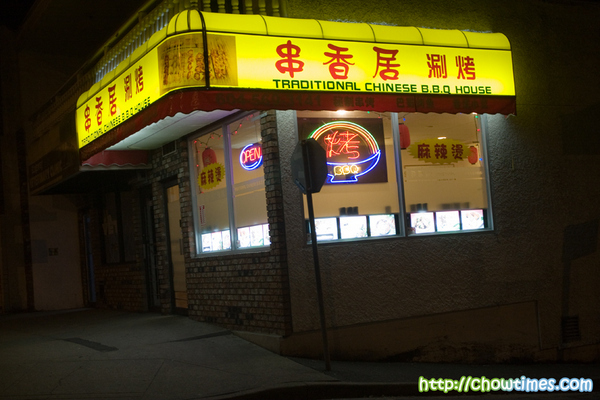 The Traditional Chinese BBQ House is located on the Vancouver section of Kingsway, between Joyce and Rupert. Although we did not know anything about this place, we decided to just chance it. This is a really small place but was quite busy for a restaurant located at such a quiet stretch. As we suspected, their customers are basically of mainland Chinese origin from the unmistakable sing-song Mandarin accent. When we got seated, we were handed their Chinese menu. 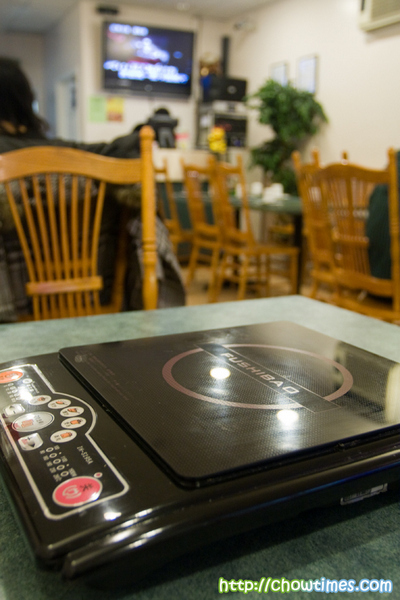 We told them we don’t read Chinese and he snickered at us … well, in a friendly way but still a snicker. So he brought out the English menu which he told us (TWICE!) that it is just delivered and he is not familiar with it. We did not trust the menu with their odd description. We thought we order by pointing to the neighboring tables. Know what he did next? He actually walked to the neighboring tables and point directly into their dishes (which the customers were still eating) and explain the dishes for us loudly across the restaurant. We were so embarrassed with his blatant intrusion into his customer’s meal. He’s a nice and extremely helpful guy but it’s just that he doesn’t realize it is rude to others. 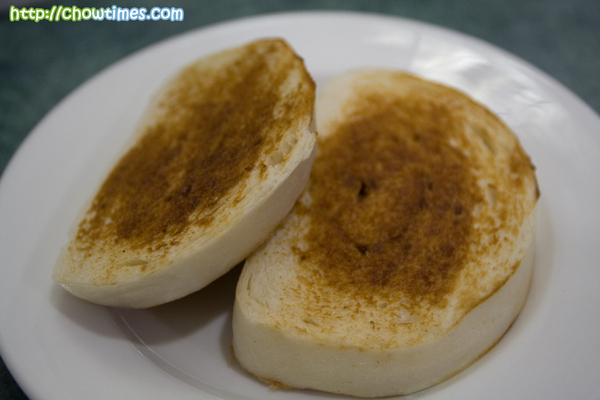 For starters, we had Steamed Bun Slice. It costs 75 cents each. 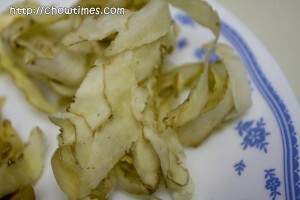 It is basically man tao, just that it is sliced and grilled with some kind of sauce or spread which we could not identify. I recommend you try it … it is unique. For those who does not speak chinese, “man tao” is translated as “ten thousand heads”. 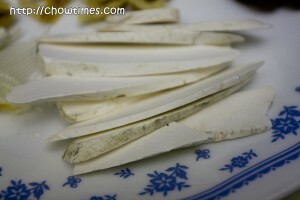 This is the staple food to the Chinese and is the kind of food that is used to feed the masses. The owner also recommended us their most popular BBQ item, the House Grilled Lamb. The restaurant actually smells of this item from the heavy use of cumin. It costs 75 cents each. It came served in metal skewers. The taste is rather strong … it is both very spicy and salty. The meat is tender and not gamey. 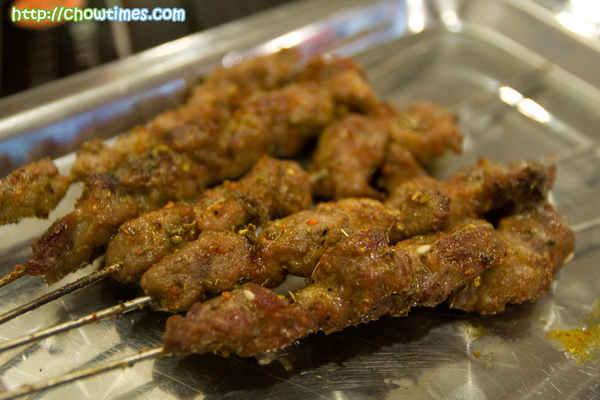 But really, we prefer the Malaysian satay better than this. Updated: 22nd Dec 2014; This restaurant is closed according to Urbanspoon.com. 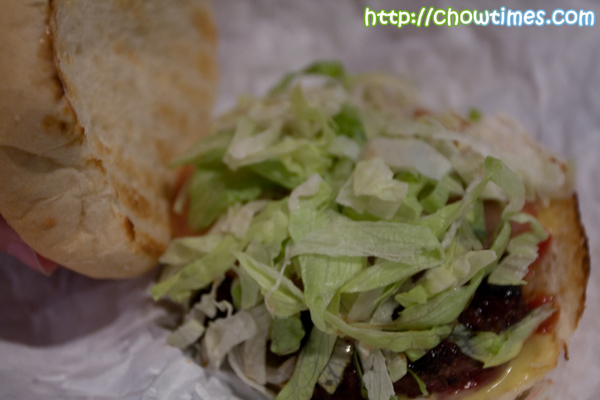 This post is written based on a complementary meal from Qoola. 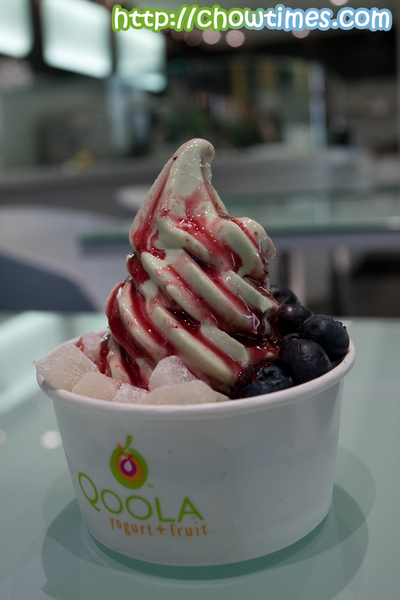 A week ago, Suanne and I received an invitation to checkout a new frozen yogurt place called Qoola. Since we were going to be in downtown anyway for the Taste BC event on the same night, we decided to pop over. I know it is kind of weird … we were going for yogurt, waffle and crepes immediately after wine and cheese, sushi, burger … all on the same night. So, Suanne, Angie and I took a short drive to the western end of Denman to where Qoola is. 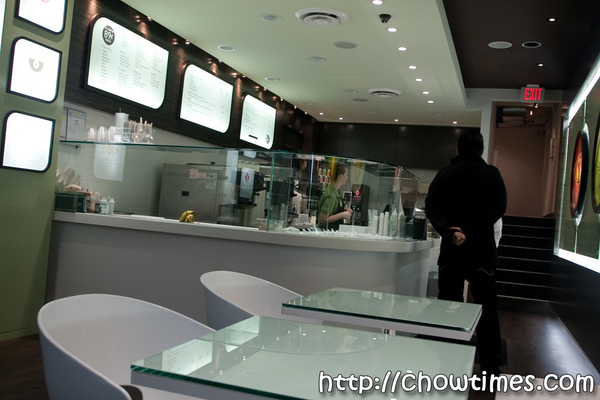 Qoola is actually located at the old location of Cupcakes (1116 Denman). We were met up front by Warrick who is the man behind the entire idea of Qoola. Warrick came across to us as a bright, energetic young man with great passion in what he does. Qoola had been opened for just one month so everything is spanking clean. We love the bright greenish interior. Qoola is green … more greener than what we expected and we soon realized how seriously green they are. We had a crash course, to say the least … much of which went swosh over my head. Too much data and too technical for me after all the wine from Taste BC. Not really a person who knows what is what, we left the choice to Warrick and his partners. The only thing we asked is that they surprise us. First came their Green Tea Yogurt with blueberry and marionberry sauce. It was good and we like it. I don’t care much for frozen yogurt. The only time I had frozen yogurt of note is Red Mango which we had in Bellevue,WA. I was told that many frozen yogurt places uses powdered yogurt which contains only about 1 million bacteria. 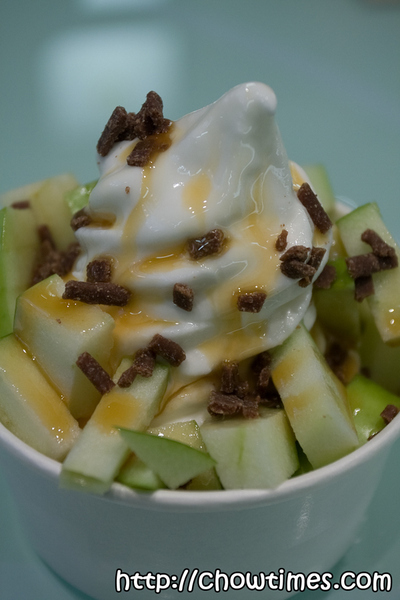 However, Qoola uses only fresh yogurt despite its limited shelf life of a couple of weeks only. Fresh yogurt has 400 times more bacteria than powdered yogurt. You know, one of the things we enjoy a lot with food blogging is when we get invited to events. Suanne and I was invited as “media” to cover the Taste BC event which held on Thursday last week. Ooooo … “media”, fancy huh? LOL! Angie (Sea Salt with Food) who is a wine enthusiast joined us. We like that because we are such babes when it came to wine and we wanted to learn from the event. I thought that we would only spend like 30-45 minutes but ended staying for almost 3 hours. We had a great time at the event. Taste BC is more of a wine than fine food event. The event is presented by the Liberty Merchant Company in the effort to bring together the best of BC wines. All proceeds from the event went to the Oak Tree Clinic of the BC Children’s Hospital. I am afraid we did not take many photos of the wine although I did try quite a lot that night. 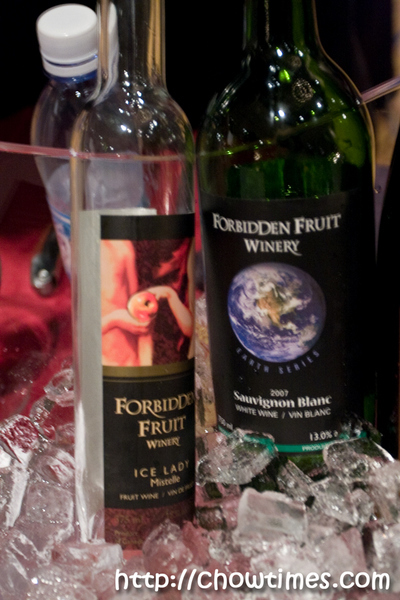 Our favourite was simply the Ice Lady ice wine from the Forbidden Fruit Winery. 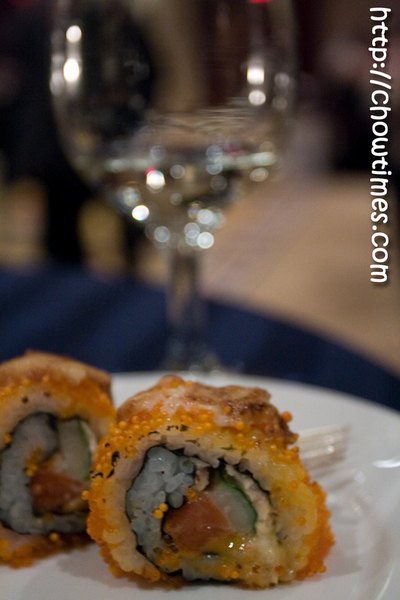 Surprisingly, almost all the food blogs that covered the event also picked this as a favourite. I want to say that no one pushed this to us to blog but for some reason it just stands out. It is made of Pink Lady Apple and is very sweet and fruity. It does not reek of alcohol at all. Suanne who does not drink loves this. I also like the Victoria Gin. They first gave me a shot of Victoria Gin which was awful, like drinking jet fuel. Then they added Tonic Water which made it like a million times better. Nice. We also had sake and learned a lot of flexibility of this brew … that how this is about the only liquor that can be served both hot or cold and its ability to be paired with any type of cuisines. The Garibaldi Honey Pale Ale (from the Howe Sound Brewing Company) was another one I like … it was smooth and light with a hint of honey. 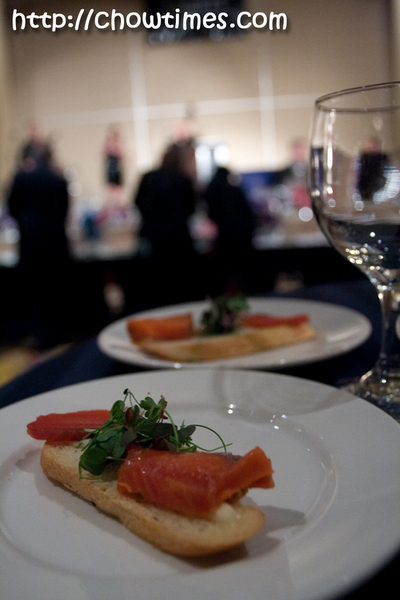 The Wild Sockeye Salmon on Artisan Bread was presented by a “baby” restaurant in Gastown. It is interestingly called “2 Chefs and a Table” which had just opened for 7 months. The Chinese celebrate the Chinese New Year on January 26th (Monday) this year. It is the year of the Ox which symbolizes prosperity through hard work. It seems apt that as the world faces the challenges of the economic crisis this year, we enter into the Chinese zodiac year of the Ox. The words above is a play on the word Ox that means “turning around to good fortune”. 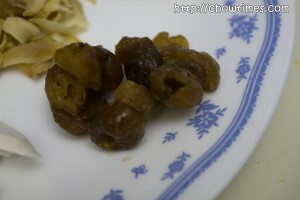 So, here is wishing every Chowtimes reader who celebrates Chinese New Year a good year ahead. May your plans and wishes comes to fruition. 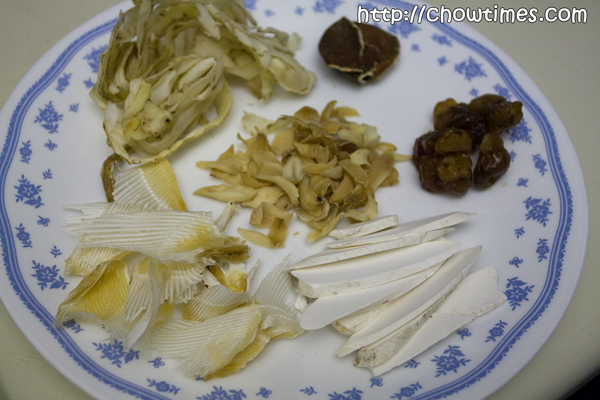 Growing up, I drank a lot of Chinese herbal soup. 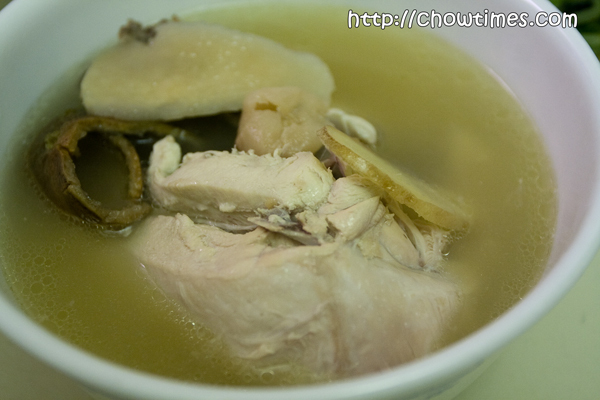 The soup can be boiled with chicken or lean pork. 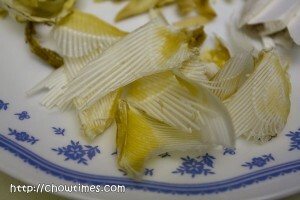 My grandma will get the herbs from Chinese herbal shop and they are usually wrapped in paper. She will tell the Chinese herbalist what is the soup for and the herbalist will mix and match different herbs for different remedy. I do occasionally made some Chinese herbal soup for the family. Unfortunately, my two kids who grow up in Vancouver do not fancy this kind of soup. I have to force them to drink the soup but not with success all the time. 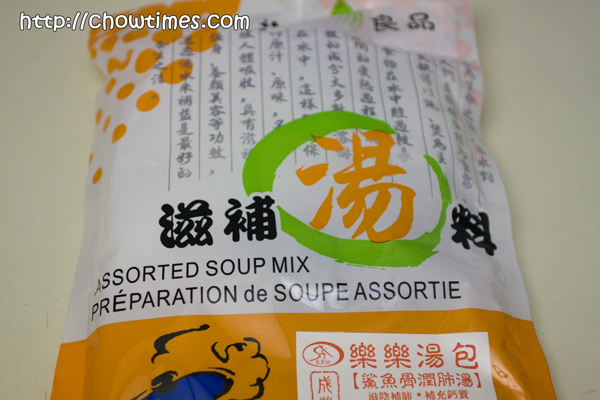 In Vancouver, we can get pre-packed Chinese soup mix. They are very reasonably priced from $2+ to $10 for the higher end of the product. This package is called “Shark Bone Lung Warming Soup”. 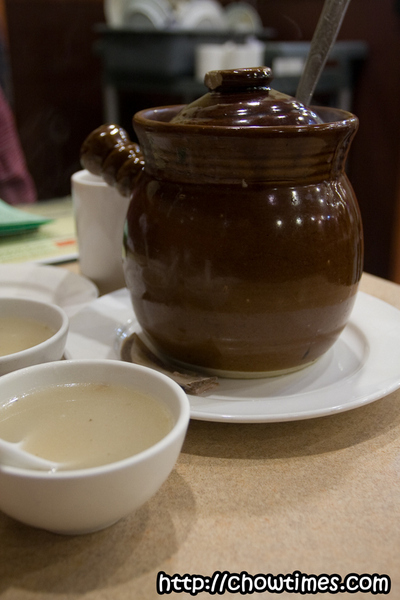 Clean the soup material with clean water, and put them into a large pot with two slices of ginger, a chicken (skin removed) or lean pork or water duck for better effect. Add about 15 – 20 bowls of water into a pot, boil on high, for 30 minutes and switch to low heat to simmer for about 2 to 3 hours. 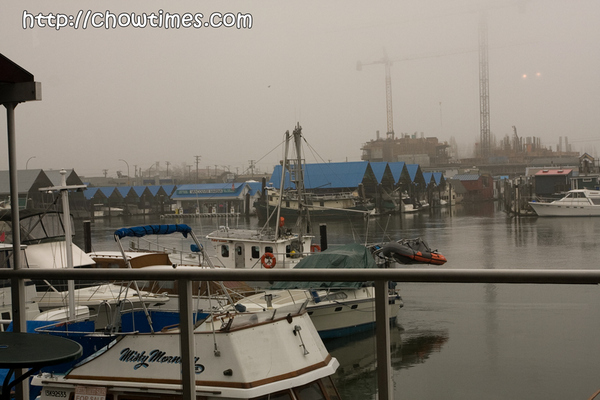 The past week was awfully foggy here in Vancouver. We got only a few breaks of the sun. It was kind of drabby, makes one so lethargic. In weather like this we did not want to really go far. So we went to this place called McKim Wonton Mein Saga because it was just a few minutes drive from home and we get to avoid driving down the dreaded No 3 Road. McKim Wonton Mein Saga is quite a name, huh? It is named McKim because it is located on McKim Way and Garden City Road. Although the name does suggest that this is principally a noodle house and their menu tout themselves as “The best Wonton Noodle House in Town”, we were told that we should try their Set Lunch/Dinners. Service wasn’t particularly great. There were hardly anyone there at 5:00PM (we eat early most days) but it took an awfully long time for them to set us up and take our orders. What irks me really is how they took our order … at times acknowledging our order with grunts. *mmm* *argg* *mmm*. Speak up! Their Set Lunch/Dinner allows you selection from about 120 different dishes ranging from seafood, vegetable, beef, pork, duck, chicken, etc. Since there are just the three of us, we ordered the Set Dinner for 3 which costs $40. 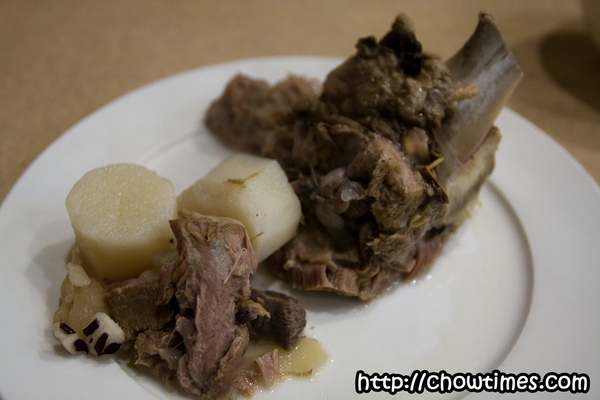 Besides a selection of 3 dishes, the set dinner also includes soup, rice and dessert. We were surprised the soup came in a pot. Normally, one would just get a bowl each. Updated 18th Nov 2010: This restaurant has been closed according to Urbanspoon. Polly and I also take the opportunity to go for a Dine Out Vancouver meal in place of our regular cake meet. Since we can only go for lunch as Polly has to pick her twin daughters from school before 2:30 pm, our choices is very limited. We ended up with Elephant & Castle Restaurant at the Delta Vancouver Airport Hotel which offers the lunch option from 11:00 am. 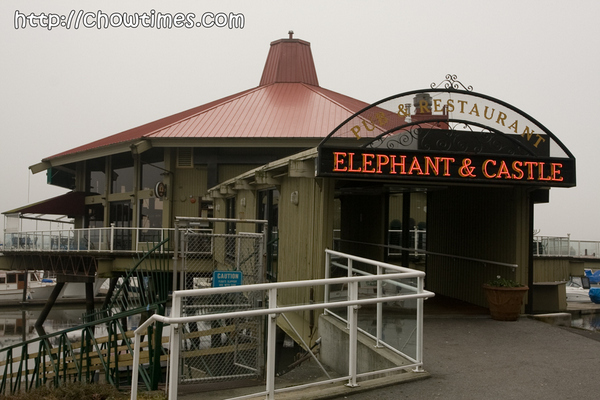 Elephant & Castle Restaurant is on the banks of the Fraser River and has a panoramic view of the oceans and mountains. Parking is free if you dine in the restaurant. Unfortunately, it is a very foggy day and the view is very limited. 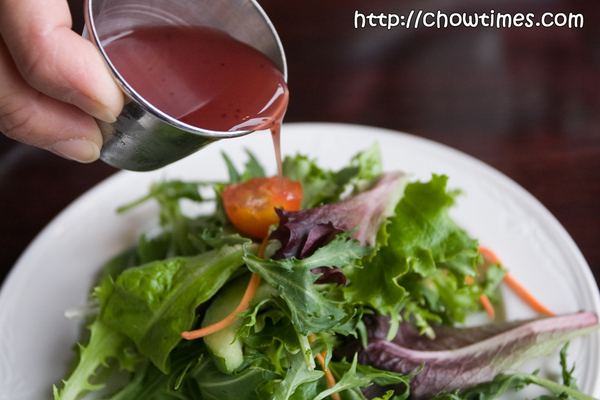 Nevertheless, the mistiness adds a sense of mysteriousity to the dining experience. 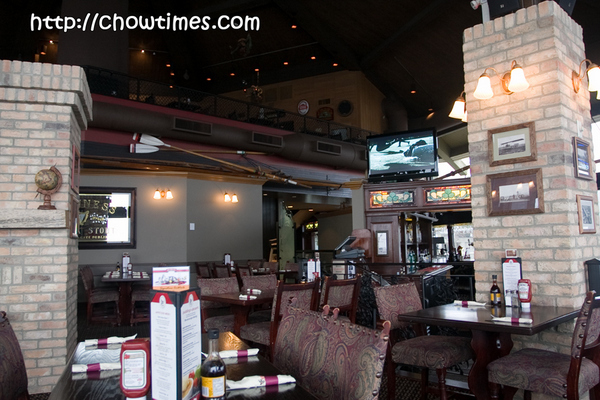 Elephant & Castle is North America’s leading British Pub and Restaurant chain across Canada and United States. This location has a fairly large seatings on 2 levels. It has a bar and thus minors are not permitted. Elephant & Castle offers a 3 course menu for the Dine Out Vancouver 2009 for $18. For appetizer, we opted for a soup and a salad. Polly and I decided to share our dishes and we asked the waitress for extra bowl to share the soup. The waitress is kind enough to serve the soup in 2 different bowls and gave us extra serving plates for sharing for the rest of the meal. I like their services. Back to the soup, the soup of the day is Seafood Chowder. 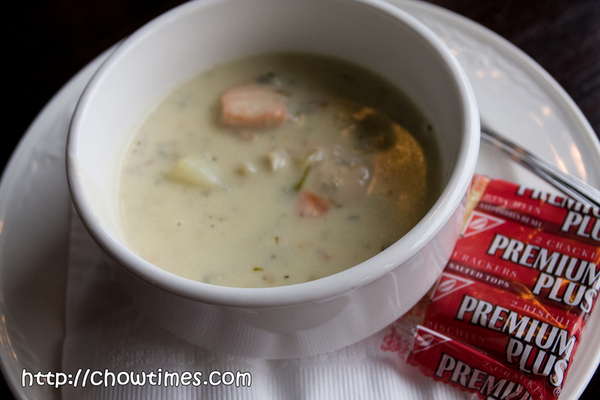 It’s a creamy soup with salmon, prawn and potatoes with crackers served on the side. It’s quite an ordinary chowder.